The Custom Data Set Report is a very flexible report which offers the most filtering options to see exactly what you are searching for. Indicate whether the search should work on just files, just directories, or both. 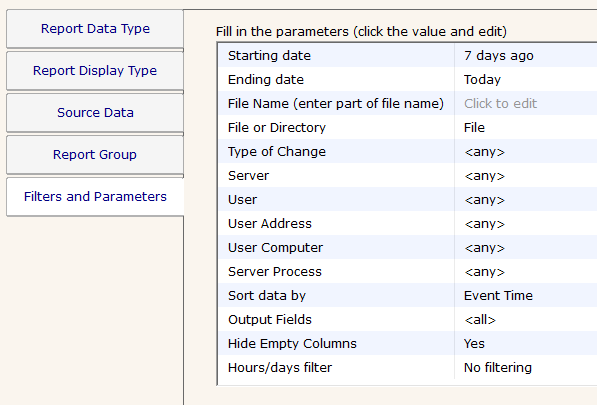 Select a specific user for which file activity is being reported. A list of users seen will be loaded from the database. Select a specific user IP address for which file activity is being reported. A list of user IP addresses that have been seen will be loaded from the database. Select a specific user's computer name for which file activity is being reported. A list of user computer names that have been seen will be loaded from the database. A list of all server processes will be loaded and shown from the database. Specify those that you want to report on. The special System or Network entry is used when the server operating system was the source of a file operation, OR when the operation came from a remote computer (a request from the network).